ISI - Industrial Scaffold Inc. Welcome to Industrial Scaffolding Inc.
Industrial Scaffolding Inc. is dedicated to providing safe, efficient access solutions. Located in St. John's, Newfoundland, providing safe access solutions both onshore and offshore in Newfoundland and Labrador. Now offering NACE Level 1,2,&3 Coatings Inspections to all our Customers. ISI has approved fall arrest inspector on staff for all your inspection needs. ISI is now a distributor of swing stage platforms manufactured by WINSAFE CORP. In addition to that we are proud to be Newfoundland & Labrador's dealer for TRACTEL equipment. With this arrangement we can have a swing stage platform, specially designed for your specific needs. 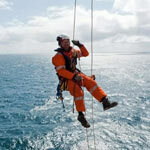 Whether it be confined space, boiler internals, or offshore platforms. An engineered swing stage is a cost effective way to get your job done. ISI just started the SOBI Project for Nexans Norway in Shoal Cove & Forteau. We now have 31 employees employed throughout the province. We are pleased to announce that ISI has been awarded a 3 year maintenance contract by Vale at Long Harbour, Newfoundland. © 2019 - Industrial Scaffolding Inc.